Namco Bandai's gravity-based shooter won't be coming out until February of next year, as opposed to its original 2010 release date. Way back in 2009, Namco Bandai announced a new third-person shooter called Inversion. The game certainly sounded interesting, since it featured a gravity manipulation feature, and it was originally scheduled for a late 2010 release. That deadline was obviously missed, and Namco Bandai's announced a much later release date. Inversion is now scheduled to launch on February 7, 2012. The game is being developed by Saber Interactive (the studio behind TimeShift), and is currently planned for both the 360 and PS3 consoles. 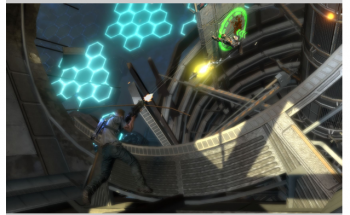 According to Joystiq, the game "allows you to create isolated zero-gravity fields, forcing objects caught inside to defy nature's laws and provide some cover against enemy fire." This is a pretty major release date change. The fact that it's been pushed back by over a year demonstrates that the game still needs a lot of work, but Namco Bandai clearly still believes in Inversion enough to put it out. Hopefully the extra development time is worth it.